1.2. Who produces knowledge on Brussels at war? This synopsis is based on a study which was carried out with the support of Visit Brussels. 1The hundredth anniversary of World War I has put the spotlight on this period once again. The media coverage of the commemorations is unprecedented and even surprising for a conflict which has remained in the memorial shadow of the even more deadly World War II [Bost & Kesteloot, 2014: 5]. While there was every reason to believe that the Great War was only a distant memory, it must also be noted that it is the object of true curiosity on the part of the general public. Even before the hundredth anniversary, more than 90 % of students from western and Asian countries who were asked to name the most important events of world history already placed World War I in second position [Liu, e.a., 2005]. In the collective memory, it is therefore much more important than what was believed for a long time. In addition to the considerable financial and material means allocated in recent years by the public authorities to organise the hundredth anniversary, there has been a true popular interest, as demonstrated by the crowds who attended the many commemorations and exhibitions during the summer of 2014. The interest on the part of the general public is also surprising at a time when a decline in historical knowledge has often been mentioned. 2The hundredth anniversary has also led to a number of publications, most of which are in keeping with the historiographical revival surrounding World War I for the past twenty years or so.1 The case of Belgium has thus been well studied, being the subject of some very good synopses. However, while several recent studies have used Brussels as a framework, a global and comparative academic summary specifically devoted to the capital does not exist. 3The present synopsis is not aimed at tracing the history of Brussels during World War I, or at presenting the results of the latest works on this subject, but rather at examining the material traces and the immaterial heritage left by this conflict, based on analyses carried out in recent years. What remains of World War I in Brussels? Who is interested in it, and why? How does this conflict resonate today in Brussels’ memories? How are they reflected in the urban space? In other words, this synopsis reverses the historical temporality to observe the results of the sifting of time. 4This synopsis is divided into three parts. The first presents the institutional framework and the structures in which the memory and traces of World War I have been found for the past century in the Brussels region. The second examines some of its urbanistic, socioeconomic and memorial repercussions. Finally, the third focuses on the less known immaterial traces which still nourish the public debate. In 1914, the urban area of Brusselsa had approximately 790 000 inhabitants, i.e. close to one tenth of the entire Belgian population. On 20 August 1914, scarcely two weeks after the German army arrived in the Belgian territory, it entered the capital without any fighting and took control of the main places of power. It stayed for 51 months. Until the Armistice, Brussels lived under the total control of the German authority, in a daily confrontation which no other western European capital experienced. This occupation gave a unique character to the Belgian experience of the war. a 16 municipalities formed the urban area of Brussels in 1914. 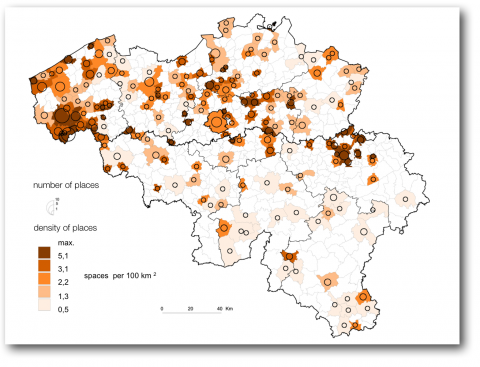 The villages of Evere, Berchem, Ganshoren and Woluwe-Saint-Pierre were not yet included. The municipalities of Laeken, Haren and Neder-over-Heembeek were annexed to the territory of the city of Brussels in 1921. Here, when we use the name “Brussels”, we are referring to the current 19 municipalities of Brussels, and use the terms “Brussels-City” or “City of Brussels” to refer to the municipality itself. 5Due to the presence of approximately fifty higher education institutions and many public bodies with study and research departments, there is a concentration of many knowledge stakeholders in the capital today [Vaesen & Wayens, eds., 2014]. This situation therefore has an impact on the “production” of historical knowledge: an impressive number of stakeholders work in the area of the history of World War I in Brussels: federal academic institutions (Archives générales du Royaume, Bibliothèque royale, Cegesoma, Musée Royal de l’Armée et d’Histoire militaire, etc. ); federal public services (Institut National des Invalides de Guerre (SPF Défense), Service des Victimes de guerre (SPF Sécurité sociale), Commissariat général à la commémoration de la Première Guerre mondiale, etc. ); services of the Ministry of the Brussels-Capital Region and regional semi-public organisations (Direction des Monuments et Sites, Visit Brussels, etc. ); and community administrations (in the framework of community competence in the area of education, several projects related to citizenship and duty of remembrance have focused on the war, such as the Démocratie ou Barbarie unit of Fédération Wallonie-Brussels or, as regards the Vlaamse Gemeenschap, the Vlaams Vredesinstituut created in 2009). All of the municipalities of Brussels, led by Brussels-City, also commemorated more or less actively the hundredth anniversary by organising a wide variety of initiatives (brochures, exhibitions, commemorations, etc.) [for a theoretical and methodological framework of these local initiatives, see: Nath & Van Alstein, 2012], often with the support of many associations or local history circles, whose initiatives are difficult to list in an exhaustive manner [regarding the controversies related to commemoration policies, see: Bost & Kesteloot, 2014; Lefèvre, 2013]. 6This intense activity surrounding the commemorations gave a boost to the historical works regarding a capital which had been neglected for many years in terms of research on 1914-1918. 7Firstly, the history of Brussels in 1914-1918 has not been written by historians. The situation of the capital is of course mentioned in the excellent synopsis from 1928, which Henri Pirenne devoted to Belgium and the World War, as well as in other general interest works published during the interwar period. But, as in many other Belgian municipalities, it was above all journalists, politicians and columnists who published their works on the history of the capital under occupation. These men (and, less commonly, these women) often wrote in the first person, as participants and witnesses of their time. Although certain stories were published while the conflict was still raging, it was during the first post-war years that this wave of testimonies reached its peak [in the absence of an exhaustive inventory of published testimonies on Brussels at war, see: Lefèvre & Lorette, eds., 1987: 437-449]. This early story-telling of the Great War by direct witnesses is of course not specific to Brussels: almost every occupied municipality in Belgium had its local column. However, the phenomenon in Brussels grew to an unprecedented scale due to its status of capital city, synonymous with the presence of a large number of publishers and intellectuals likely to take up the pen, as well as a vast market of potential readers. 8Although they were set in the patriotic frameworks of the interwar period, these testimonies still had an exceptional documentary value. They often depicted Brussels as an open-air prison and never neglected to boast about the rebellious spirit of its inhabitants who were part of the resistance before the term existed, which continued until 1918 [see in particular: Tytgat, 1919; Twels, 1919; Gilles, Ooms & Delandsheere, 1919, Vierset, 1932]. These testimonies also had the advantage of highlighting the diversity of experiences within the urban area of Brussels and in particular the suburbs of the capital at the time [see for example: Bertrand, 1919; Frick & Lynen, 1920]. One hundred years later, these works are all the more vital sources, as the history of Brussels during the Great War had a strong tendency to blend with that of its city centre. 9As regards historians, the interest in studying life in Brussels during World War I is a relatively recent phenomenon which has developed significantly over the last decade. The general index of place names in the bibliography of publications from 1985 - 2000 on Belgium during World War I [Tallier & Soupart, 2001] is symptomatic: there are still only 16 references to the municipalities of Brussels (13 of which are to Brussels-City), i.e. scarcely 1,6 % of the total number of places referenced.2 Map 1 illustrates this clearly: the geographic focus of the vast majority of contributions is concentrated elsewhere than in Brussels. While the observation is of course related to the special situation of a capital which was largely free of fighting, it ignores its essential role during the entire conflict: as a city at the heart of a very centralised small country, the seat of all of the national institutions and many companies, and the only western capital which was occupied throughout the conflict, Brussels had something to draw the attention of researchers. 10Since 2000, the situation has evolved greatly. An increased interest in World War I in Brussels has become evident in historical production beyond the strict framework of universities. This evolution has favoured a “fragmented” approach according to micro-themes, which are more commonplace and sometimes even anecdotal. Many of these works have been published by public institutions such as archives, libraries and museums (with a clear over-representation of Brussels-City). The widening of the scope of stakeholders does not mean that the academic world has lost interest in the subject. On the contrary: the number of works, research papers, final theses, doctoral theses and even exhibitions in universities has continued to grow. 11While the keen interest and diversity of the stakeholders involved favoured better knowledge of the history of Brussels during World War I, global studies of the urban area of Brussels in 1914-1918 are still largely lacking. The fascinating history of the only western European capital to experience the Great War under foreign occupation remains to be written. This history must of course transcend a still very local and monodisciplinary approach in order to make a connection between the observations related to World War I in the Brussels region and the transnational and global processes and mechanisms [Winter, 2013: 15]. 12After the first post-war years, the publication of testimonies regarding occupied Brussels slowed down gradually and there was a growing lack of interest due to World War II. During the following decades, when contemporary history finally became established in university departments, the occupation of 1940-1945 received almost all of the researchers’ attention. The study of 1914-1918 which, in contrast, suffered from a blatant lack of means and legitimacy [Benvindo, Majerus & Vrints, 2014, 170-196], focused almost exclusively on the fate of Flemish soldiers on the front, on activism and on the role of Albert I; three debates in which Brussels plays a minor role. 13It was not until several decades later that new pieces of the social history of the capital at war were rediscovered little by little. At the end of the 1970s, historian Peter Scholliers began to focus on various socioeconomic indicators in order to understand the evolution in the standard of living, diet and health of the inhabitants of Brussels during the occupation [Scholliers, 1978]. For the first time, the entries into and exits from war were drawing attention [Van Caubergh, 1986; Sieben, 1988: 155-176] – a theme which had great historiographical success a few decades later. However, these are only isolated efforts: World War I is still a historiographically marginal theme, as evidenced by the fact that only two pages were devoted to it in the superb book Bruxelles, croissance d’une capitale, which, in 1979, gathered no less than 40 specialists in the history of the capital [Stengers, 1979]. While the studies on Brussels benefited at this time from the development of urban history, the historians of the capital, like their colleagues whose work was focused on Antwerp or Ghent, put forward the pre-industrial era and macro-historical evolution resolutely as the growth of a metropolitan space, the evolution of the urban landscape or the socio-linguistic transformations of the city. The “short period” of the world wars was largely ignored. 14This resulted in considerable gaps on themes as important as the impact of World War I on the Brussels economy. The life of private companies, their managers, frameworks, staff and workers were largely unexplored, like that of the public institutions and their workers. Synopses on the history of the Brussels economy published between 1979 and 1989 simply overlooked the period of World War I [Stengers, ed., 1979: 216-222; Smolar-Meynaert, ed., 1989: 262-291; Martens, ed., 1976: 425-454]. This observation even applies to the history of companies which are nevertheless well documented, such as Compagnie des Bronzes – a jewel of the metal industry in Molenbeek-Saint-Jean [Fabrique d’art. La Compagnie des Bronzes de Bruxelles (1854–1979), 2004] – even though a systematic analysis of the historical monographs of companies in Brussels remains to be carried out. With the exception of the Brussels press, the world of companies and labour is therefore scarcely present in the publications related to daily life in Brussels between 1914 and 1918 [Jaumain & Piette, 2005: 15-21]. It was not until the end of the 1990s that the history of Brussels during the Great War slowly began to emerge from this remarkable obscurity. 15The turn of the century was marked by the revival of a Belgian historiography of the Great War which was finally adhering to the questioning and networks of its European neighbours. In this movement of catching up, the national framework was favoured above all. It was therefore initially in an indirect manner that the experience of Brussels in 1914-1918 was understood: many new elements emerged in works which were not limited to the perimeter of Brussels, with the capital playing a central role [for a more detailed presentation of very diverse subjects in recent research, see: Benvindo, Majerus & Vrints, 2014]. 16At institutional level, at the beginning of the 2000s, there were also joint efforts by archives (in particular the Archives de la Ville de Bruxelles) and research units (at ULB, the Centre interdisciplinaire de recherche sur l’histoire de Bruxelles, later Bru-Cités) to give new life to the Brussels experience in 1914-1918 via different exhibition and publication projects [Jaumain & Piette, 2005; Jaumain, Piette, Pluvinage, 2005; Majerus & Soupart, 2006]. Nevertheless, in comparison with a flourishing Belgian historiography of the Great War, there are still relatively few works centred specifically on Brussels. In a simplistic manner, three analytical frameworks of the war stand out: the question of the maintenance of order [Majerus, 2007], the heritage of the conflict in memory and in the Brussels space via war memorials, the creation of patriotic icons, songs, etc. [Janssens, 2013; van Ypersele, Debruyne & Kesteloot, 2014; de Schaepdrijver, 2015], and finally, the in-depth study of individual voices which tell of daily life during the occupation, merging as it were with the story which was first written essentially by the witnesses [de Schaepdrijver, 2005; ID., 2010]. 17A century after the conflict, are we able to say that we really know about the Brussels experience in 1914-1918? Despite the recent dynamism of historiography, nothing is less certain. The many publications from recent years cannot hide a reality: there needs to be a long synopsis which would intersect the social, spatial, cultural, economic and political dimensions. The research on the occupied capital remains too fragmented. In other words, the socially and geographically differentiated impact of the Great War on the entire Brussels territory still has to be explored. What is known, for example, of the old people, some of whom were forgotten by the welfare policies? Or of the women who attacked the town hall of Molenbeek in 1916 to protest against famine? Or of the fairground workers who were forced by the conflict to adopt a sedentary lifestyle? Or of the shopkeepers who are remembered in the popular imagination only as being tight-fisted? Or of the evacuees who appeared in the second half of the conflict? Or of the young people who went to the cabarets in the Marolles throughout the occupation? The entire urban dynamics needs to be reinvestigated in a global manner and by going beyond the city centre: the history of Brussels in 1914-1918 is still often confined to what happened between the Bourse and the Palais de Justice. Still now, very little is known about the specific experience of the municipalities of Brussels – let us point out that a municipality such as Schaerbeek already had 100 000 inhabitants in 1914 – not to mention the history of the different neighbourhoods of the capital and their inhabitants, and even of the still largely rural outskirts. 18These deficiencies are startling, given the new orientations of an international historiography which is more and more attentive to how the civilian populations experienced this “total war”, and of an urban history at the heart of the renewed research on the first world conflict. More than ever, a history of Brussels in 1914-1918, seen as a mass of “shared spaces (and) disputed spaces” [Dessouroux, 2008], remains to be written. 19World War I has nevertheless left a series of material and immaterial traces on the territory of the region, which link it to the present time. the relics inherited directly and indirectly from the war. 21The studies on the demographic consequences of World War I in Belgium are rare [Eggerickx, 2014]. There are two main reasons for this. Firstly, there is a lack of reliable data due to a context in which the statistical production apparatus was operating at a slow pace. Next, it must be borne in mind that with respect to the other belligerents, Belgium was relatively untouched by war-related deaths: the military victims/population ratio is six times lower than that of France [Rohrbasser, 2014]. Nevertheless, in Belgium, all of the demographic parameters bear the mark of World War I, as not only a large part of the territory was occupied by the German army with – on top of fierce fighting – the abuse of the civilian population and a significant deterioration in living conditions, but also, the conflict was “a break in the behaviour and practices of individuals” [Faron, 2002: 5]. What was – in the urban area of Brussels (defined according to the current 19 municipalities) – the direct demographic impact of the war during the years of occupation and its consequences in the following decades? 22As we know, a drop in the birth rate is often one of the main demographic consequences of a war, thus prolonging its impact for many decades. Belgium and Brussels in particular are no exception to this rule: from 1914 to 1919, the birth rate in the country dropped from 20 to 11,5 ‰, whereas in Brussels, it decreased by half, from 15 to 7,5 ‰, i.e. a historically low level. But the capital stands out above all as regards the low birth rate. At the level of Belgium, the low rate ascribable to the conflict was of the order of 36 %, whereas it was 43 % in Brussels. Only the regions located on the Yser front line recorded a drop in the birth rate which was proportionally more significant. 23The drop in the birth rate during the war years was in part related to the decrease in the number of marriages; these were either “prevented” by the absence of men (on the front, prisoners of war or, for some, forced labour in Germany), or postponed due to the deterioration in living conditions during this period [Majerus, 2005] and the uncertainty about the future, which resulted in Malthusian behaviour [Eggerickx, 2004]. Undernourishment may also have made women temporarily infertile [Scholliers, Daelemans, 1988]. 24However, as seen in figure 3, the years 1914, 1915 and 1916 were characterised curiously by a decrease in the mortality rate, which soared from 1917 to 1919 before dropping again to a more normal rate. This sequence was seen elsewhere, in Wallonia and in the industrial area of Charleroi [Eggerickx, 2014], as well as in other countries, such as France and Germany. The death statistics from these regions and from Brussels illustrate the worsening of living conditions and in particular the provisioning difficulties which affected the civilian populations beginning in 1917. 25The war also had a lasting impact on the age pyramids. Figure 4 presents the situation of the urban area of Brussels in 1910 and 1920, with both populations reduced to the same basis of 10 000 inhabitants in order to allow a comparison. 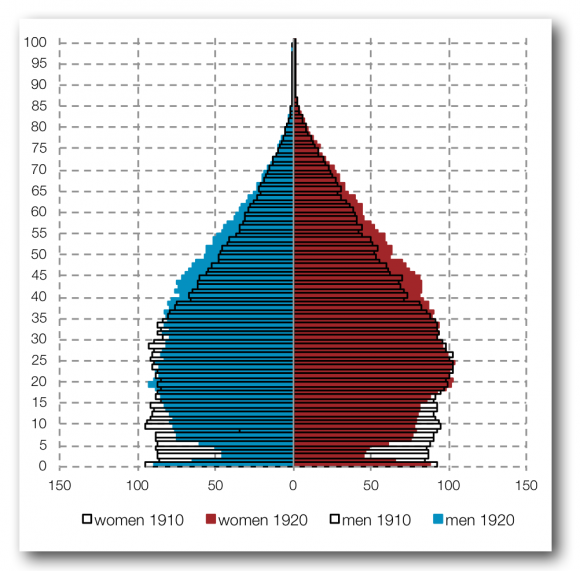 Two “abnormalities” in the structure according to age and gender in 1920 are observed immediately: firstly, the significant indentation at the base of the pyramid shows the low birth rate, and the notch with respect to men aged 25-34 in 1920, i.e. the generations aged 20 - 30 when the conflict broke out. This higher male mortality rate led to an increase in the widowhood rate among women aged 20 to 40, of the order of 35 % for the country, and of “only” 15 % for the urban area of Brussels. 26The demographic impact of World War I therefore continued well after the end of hostilities. The conflict probably amplified the birth rate control (begun several decades earlier) and impeded (at least for certain age groups) the evolution of the mortality rate. 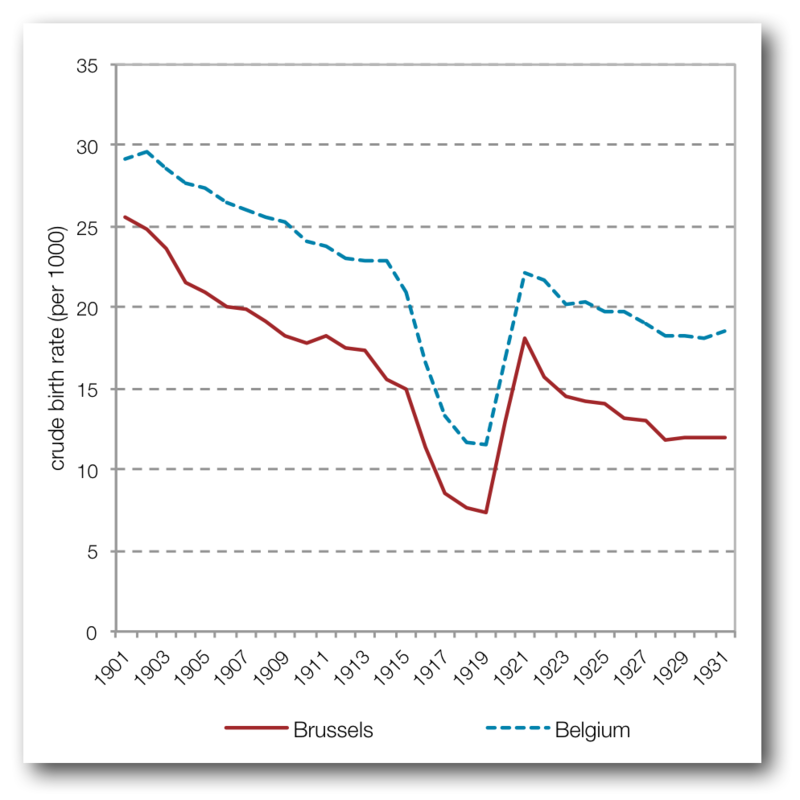 Between 1910 and 1920, the life expectancy at birth in the urban area of Brussels increased from 52,8 years to 59,1 years, i.e. an increase of more than six years, while it was less than four years between 1900 and 1910. At the same time, at the scale of the country, the average life expectancy increased by only three years (and by only one year between 1900 and 1910), from 50,7 years to 53,5 years. Based on this average indicator, World War I was only a brief mishap in the improvement of survival rates [Winter, 1988], particularly in the capital. 27The progress of life expectancy between 1910 and 1920 is related essentially to the decrease in the mortality rate of young children and adults over the age of 35. Compared with the national situation and that of the two other regions, the decrease in the mortality rate is not only more significant in Brussels, but among children and adults, it concerns wider age ranges. The noticeable decrease in the mortality rate of young children, even during the war years [Winter, 1988], is mainly due to the development of child protection charities (infant wellness visits, nursery canteens, etc.) in reaction to the drop in the birth rate and the food crisis [Majerus, 2007; Masuy-Stroobant, 2005]. 28However, the improvement in survival rates does not concern one age group: that of young women and men aged 20 - 30 (and to a lesser extent that of adolescents). Two elements may explain this situation: among men, the greater risk of dying from war injuries, and more generally, the weakening of the population, after years of deprivation and malnutrition. Only an analysis of the causes of death would provide an explanation for this “particularity” in the mortality tables with respect to young adults. 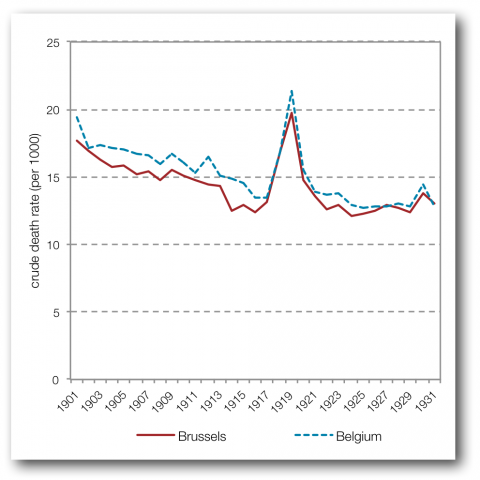 Finally, let us underline the fact that the deterioration in the survival rates at these ages is proportionally less marked in Brussels than in Belgium or in the Walloon rural areas and the industrial area of Charleroi [Eggerickx, 2014]. 29As regards the fertility rate, there was a decrease in many European countries during the interwar period [Frejka, Sobotka, 2008]. This has been interpreted by some as a consequence of World War I and of the major economic depression of the 1930s [Schellekens, Van Poppel, 2012], and by others as a simple continuation of the trends which had begun several decades earlier [Festy, 1984] and whose explanatory factors are related to the rise in individualism, consumerism and the secularisation of society [Van Bavel, 2009]. 30What was the situation in Brussels? Based on retrospective data from the 1981 census, the fertility of generations of women born between the end of the 19th century and the end of the 1920s may be traced. Figure 5 thus shows that the fertility rate in the urban area of Brussels was particularly low: scarcely higher than one child on average per woman for the generations born at the end of the 19th century, i.e. those who reached their reproductive capacity during the interwar period. These low fertility rates are evidence of very effective Malthusianism practised in marriage [Eggerickx, 2014], and in this case as well, World War I and the economic depression of the 1930s may have reinforced these trends. It may also be assumed that it is in the most urbanised areas – which are places of individualisation, anonymity and the radicalisation of behaviour par excellence – that the fertility rate reached its lowest level and that the impact of economic events was understandably the greatest. 31In Brussels, as in the rest of the country, World War I therefore left lasting traces in the demographic indicators and more specifically in the evolution of fertility-related behaviour. 32While the question is raised more specifically as to the number of World War I victims from Brussels, the conclusion should be drawn that one hundred years after the outbreak of the conflict, this seemingly simple question does not have a definitive answer due to a lack of specific research. In a presentation of the major contradictions in World War I figures, British historian Niall Ferguson underlined the discrepancies between the different existing censuses which list the victims of the conflict in Belgium. These figures vary up to threefold from one author to the next [Ferguson, 1998: 295]. Without a precise definition of the methodological framework used for counting, it is difficult to obtain a truly reliable estimate. Recently, Luc De Vos and other researchers also focused on the question and established the number of Belgian deaths (non civilians) caused by the war (of which a significant proportion were due to illnesses) to be 53 037 [De Vos e.a., 2014: 520]. A breakdown of military losses of the other powers present in the Belgian territory is still unavailable, whereas the civilian losses have received attention only recently [cf. Amara, 2004; Horne & Kramer, 2001; Lipkes, 2007; Zuckerman, 2004]. In the case in point, this is not due to simple and macabre discrepancies in numbers. The issues of the debate are much deeper, if only as regards what these figures teach us about the demographic impact of the war [see previous point] or their lasting influence on the urban social structures in terms of age groups affected, as well as involvement and socioeconomic relationships turned upside down between the different social strata which make up the city [Winter & Robert, 1999: 102]. 33The memory of these soldiers and members of the Resistance killed during the conflict is still very present in the city today via the many war memorials seen throughout the public space (see below), as well as through the sections of municipal cemeteries which are dedicated to them (there are no military cemeteries as such in the Brussels territory): the graves of 482 Belgian soldiers and 1 400 foreign soldiers (based on a preliminary inventary) are located at eight sites (including the tomb of the unknown soldier) in the territories of Brussels-City, Laeken, Ixelles, Evere, Jette, Woluwe-St-Pierre and Auderghem. 34These cemeteries (a very small fraction of the 101 military cemeteries and memorial lawns spread throughout the Belgian territory) may be divided into three categories which reflect the different official functions of Brussels. First, there is the tomb of the unknown soldier, a monument erected in 1922 in memory of all of the Belgians who died in combat. Then there are the places where Belgian soldiers as well as the victims of other armies are buried. This last point concerns five of the eight sites in Brussels mentioned above. These are mainly the tombs of the 1 236 German soldiers in Evere, as well as the graves of soldiers from the Commonwealth, France, Russia and Italy (often prisoners who died in captivity) in Ixelles, Jette and Evere. And finally, there are the sites with the graves of citizens who were shot, such as, for example, the former Tir National in Schaerbeek where 35 civilians were executed and buried, among whom are famous figures such as Gabrielle Petit, Philippe Baucq and Edith Cavell, exhumed after the war at the request of their families in order to be buried in family tombs. 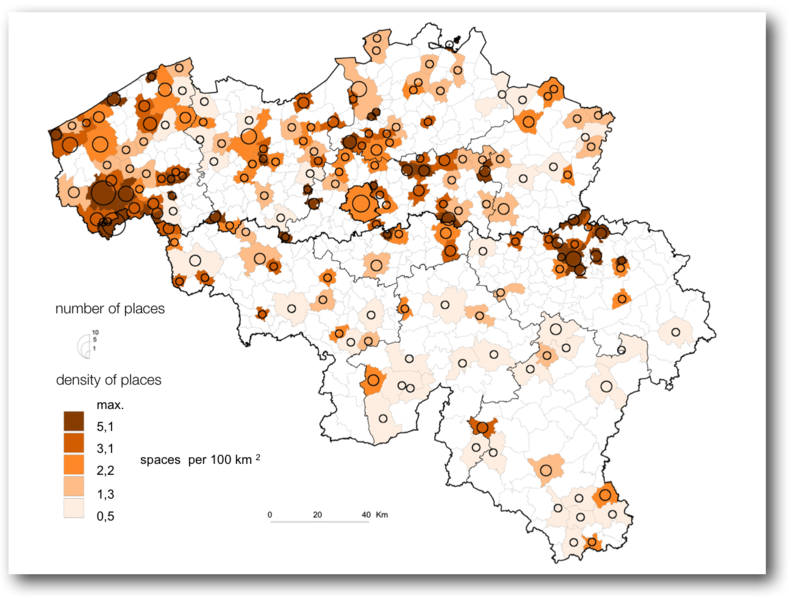 These places remind us that Brussels accounted for 15 % of all of the Belgian civilians shot during the war, which is a lower percentage than in the cities of Ghent (23 %) and Liège (21 %) [Majerus, 2005: 76; see also Van der Fraenen, 2009]. 35It must always be borne in mind that the number of people killed of course only includes the most visible of all of the “victims” of the war, as it does not consider the wounded soldiers and prisoners of war, or any type of suffering endured by the civilian populations (the refugees, the victims of different types of war-related violence, and more generally all of the inhabitants affected by the deprivation related to living conditions during the occupation). These experiences have shaped the collective memories at different levels (via official channels and instruments such as the various commemoration ceremonies, as well as via – sometimes differing – family heritage [Welzer, 1997]). 36Either because they wanted to escape the war or because they were forced to leave their homes, thousands of inhabitants of Brussels were faced with the painful experience of exile during the first world conflict. At the outbreak of hostilities, immense crowds rushed onto the roads to escape the enemy troops. Brussels was among the first cities in the country to welcome these fugitives. As of 7 August 1914, more than 3 000 refugees from the region of Liège entered the capital. Until the arrival of the Germans on 20 August 1914, the city received an increasing number of refugees. Some of them stayed for a few days or weeks, and others joined the inhabitants of Brussels who travelled by road or rail to the coast or to Antwerp, the “national redoubt” which they felt was impregnable at the time. In Brussels, compared with other cities, this phenomenon of escape was relatively limited. The capital was not the scene of violent military commitments and the relative calm surrounding the German entry was not conducive to the outbreak of vast movements of collective panic. We do not have precise statistics allowing us to measure the proportion of the inhabitants of Brussels among the 600 000 Belgians who lived abroad for four years, but everything leads us to believe that tens of thousands of them chose prolonged exile. In Great Britain alone, the number of refugees from the urban area of Brussels is estimated to have been approximately 15 000 in 1917 [Amara, 2008]. 37Due to military events, German exactions and the population movements, the war years resulted in an overall decrease in the population. At national level, the deficit reached 2,3 % between 1914 and 1919. Between these two dates, the capital lost 2 % of its population, which equalled approximately 15 000 inhabitants. However, as illustrated in Figure 6, the evolution in the annual growth rates in Brussels have a radically different profile from those of Belgium, Flanders and Wallonia. In Brussels, 1914 was characterised by a very significant demographic deficit of the order of 4 %, followed by a slight rise in 1915 and 1916 and a new loss over the following three years, which, in relative terms, was in keeping with that observed in the other regions. 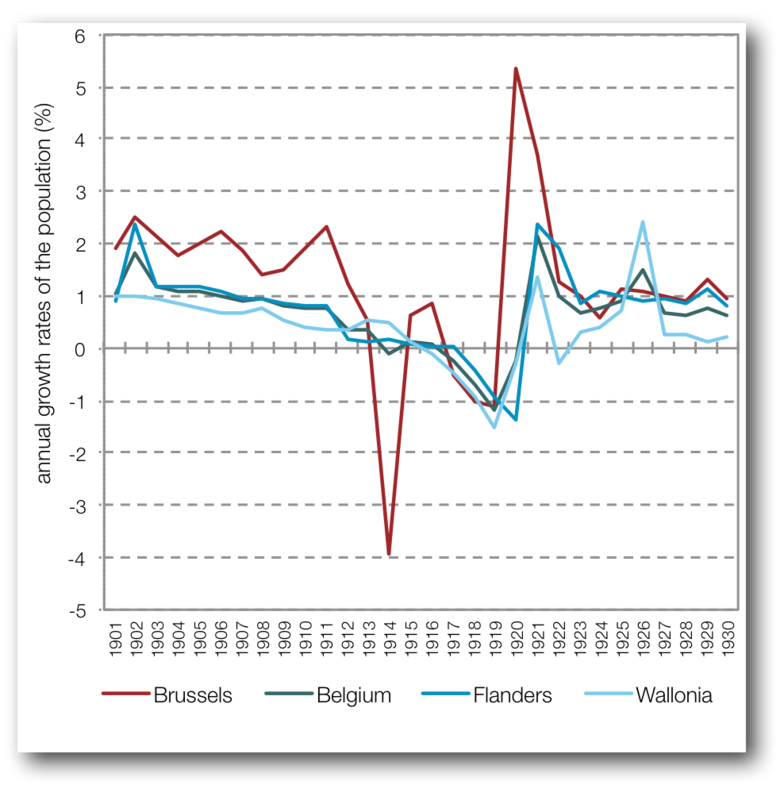 Finally, the demographic recovery in 1920-21 was proportionally almost three times higher than in Flanders and Wallonia. 38The rate of growth of the population is determined by the natural balance (the births minus the deaths) and by the net migration (the immigrants minus the emigrants). If we refer to the population movement statistics, in Brussels, before, during and after the war, the growth rate was mainly related to the migratory balance. 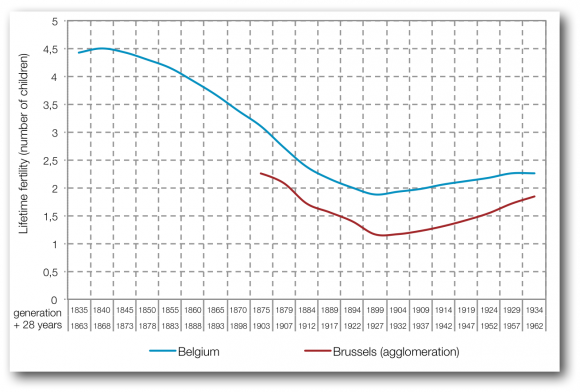 The large deficit of 1914 resulted from a very negative net migration, probably related to the exodus of the inhabitants of Brussels and to the departure of servicemen and war volunteers at the beginning of the conflict. In 1915 and 1916, the net migration became positive once again – an evolution without a doubt related to the return of some of the people who had fled the capital one year earlier. Finally, the post-war recovery was almost exclusively related to the very positive net migration. The role of migrations was therefore predominant in Brussels and only the demographic deficit of 1917-1919 resulted from a negative natural balance. 39The end of the invasion, however, did not signify an end to the presence of refugees in Brussels. The haggard exile, harassed and deprived of everything, became an almost familiar figure in the Brussels landscape throughout the conflict. These exiles stayed in approximately ten shelters scattered throughout the urban area, and received help from the Comité national de Secours et d’Alimentation (CNSA). Beginning in 1916-1917, the committee had to double its efforts, as the evacuation by the Germans of the inhabitants in the area of the front caused an influx of several hundred thousand French and Flemish people in need of food and shelter. Until they were repatriated, the French evacuees from Lens, Saint-Quentin and Douai were placed as best as possible in empty buildings. In 1918, the Allied offensive increased their numbers further: from October 1918, Brussels was stormed by more than 40 000 French evacuees. The authorities requisitioned schools, theatres and cinemas to pile in these families deprived of everything [Amara, 2010: 211-223]. 40Little remains of these vast population movements which deeply marked World War I in the memories and public space in Brussels: a bas-relief of the “Monument de la reconnaissance britannique” at Place Poelaert reminds us of England’s generous welcome extended to Belgian refugees, and the Peter Pan at Parc d’Egmont was inaugurated in 1924 to remember the bonds of friendship formed between children from the two countries. This extreme discretion reflects the very reserved reception which the hundreds of thousands of Belgians received when they returned from exile, whose suffering was almost erased from the collective memory [see Amara, 2008]. 42In the end, the deportations were a failure, with most Belgians refusing to sign a work contract, despite constraints. Guillaume II put an end to it through an imperial ruling on 14 March 1917, and most of the deportees from Brussels returned home gradually, weak, ill and even incapable of going back to work. They were cared for mainly at Saint-Jean hospital [Delplancq, 2001: 532-533]. 43Although the deportees were very quickly recognised as civilian victims of the war, they were very careful to assert their rights after the conflict. On 10 June 1919, a first law granted them a compensation. It was soon judged to be insufficient and not adapted to the prejudices experienced, and was complemented by a new law on 25 July 1921, which increased the amount of compensation somewhat. The slowness of procedures led to increased attention among the deportees to the signs of recognition: a series of commemorative plaques with the names of those who died in captivity were inaugurated [Claisse, 2000: 142-143], whereas a cross of the deportees was created in 1922 to recognise their suffering [Arrêté Royal of 27 November 1922]. 45As it did not experience any fighting during World War I, Brussels has no direct physical traces of the military conflict. However, with respect to the seriousness of this event, the suffering endured by the population of Brussels and the memory of those who would never return, very early on there was a need to preserve the memory of the event in order to give it meaning and to pass on the memory of the Great War to future generations. 46In the Brussels landscape, the material memory of the war is manifold: it was international, due to its status of capital, with the erection of monuments at the end of the conflict to pay tribute to the allied nations and their representatives (Verdun, Clémenceau, Brand Witlock, etc. ); national, with the celebration of major Belgian military figures (King Albert I, General Jacques, Meiser, Leman, etc. ); local, with the preservation of the memory of inhabitants, soldiers, parishioners or simple citizens who had fought against the occupant; and sometimes even “universal”, by praising the great virtues which had contributed to the final victory (peace, resistance, bravery, etc.). The inventory made by Emmanuel Debruyne in the framework of a study on memory and the war in Brussels [Van Yperseele, Debruyne, Kesteloot, 2014] identified more than 600 material traces of the Great War present today in the territory of the Brussels-Capital Region, mainly in the form of monuments, elements in the toponymy and commemorative plaques. The main results are summarised below. 47This study showed that no other historical event – neither the revolution of 1830, nor World War II – has left such a deep mark in the landscape of the capital. The toponymy of Brussels thus grants special attention to the heroic figure of the soldier, either in a collective manner (Rue des Braves, Rue des Anciens Combattants, Rue de l’Infanterie, Rue des Grenadiers, etc.) or in an individual manner in several rural and less populated municipalities, which named dozens of streets after their young men who died in combat. As an occupied capital during the entire conflict, early on, Brussels honoured the figures of the famous civilians (Adolphe Max, Cardinal Mercier, Ernest Solvay, etc. ), anonymous civilians (deportees, heroes, etc.) and patriots killed by the enemy (Philippe Baucq, Gabrielle Petit, Edith Cavell, etc.). 48While from a numerical point of view, street signs are the most common memorial trace in Brussels, the monuments of course mark the space in the city symbolically. The vast majority of them were erected at the beginning of the 1920s, and they often have a resolutely conservative decorative and architectural language, inherited from the “statuemania” in force in the 19th century: draped female allegorical figures, soldiers lying next to the national flag, and busts of great men with sombre gazes perpetuate the memory of the conflict in a conventional – not to say backward-looking – solemn register. In the eyes of their contemporaries, the monuments exalted – with fervour and in a tone which was more often pacifistic than vengeful – the martyrdom of the homeland, in whose name the suffering endured for four long years had not been in vain. 49The location of these memorial traces in the regional space may at the same time be considered as the fruit of the urbanistic evolution of the different municipalities of Brussels and the result of the more or less asserted will of their town councillors to perpetuate the memory of the war. While the “local” memory of the conflict is present in the entire region – each municipality has a war memorial (and sometimes two: at the market square and the municipal cemetery) – Brussels-City is naturally the main recipient of the international and national memories of the war, with several major symbolic monuments in its territory, most notably the tomb of the unknown soldier, which was a tribute to all of the Jass5 who died during the conflict. 50On the contrary, it may be noted that the municipalities in the outskirts have the highest proportion of toponymic tributes. These villages – which were quickly becoming urbanised during the interwar period – named many of the new roads in memory of World War I. One of the most emblematic examples is without a doubt the municipality of Auderghem, which chose to remember the 47 soldiers with a link to the municipality who died in combat by naming 47 different streets after them [Van Ypersele, Debruyne & Kesteloot, 2014: 246-250]. This attention to the “simple” soldiers is quite remarkable in that it favours what may be referred to as a “bottom-up” approach, as the dominant frame of reference consisted rather in glorifying the political and military leaders. This type of practice was much more difficult for the municipalities in the inner ring, which were already densely populated and urbanised at the beginning of the 1920s. These municipalities therefore often favoured the inauguration of plaques and monuments rather than changing the names of streets, which were sometimes very old and therefore deeply engrained in the public memory. 51All of this illustrates the diversity which characterised the policies of the municipal authorities and their essential role in this process. As such, even in the capital, the national government scarcely had the power to monopolise the memorial policy. As in Westhoek where the local authorities were at the origin of 26 % of all of the memorials erected [Jacobs 1995], the municipalities of Brussels used their autonomy fully to intervene massively in the public space and give their own interpretation to the collective memory. 52On the contrary, the number and diversity of municipal initiatives also allow a better identification of what is lacking or underestimated in the public space in Brussels. The commemorative actions and monuments are nurtured by a certain number of received ideas and implicit assumptions6 aimed at reinforcing what is believed to be known about these years. 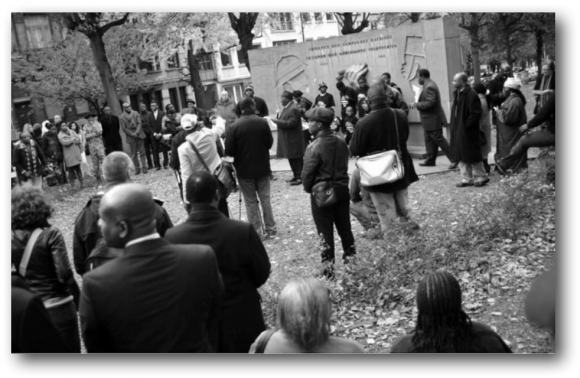 The municipal story is compatible with the meta-narrative told by the communities which organise and finance the memorial efforts. 53An excellent illustration of this phenomenon is that of Belgian colonial history with which Brussels clearly has an inseparable link [Stengers, 1989 [revised ed. 2005; Vanthemsche, 2012] but whose current memorial high mass takes little account of it. The only issue which seems to receive attention is related to the presence of Congolese troops in the military operations in Europe and Africa or in the trenches, alongside metropolitan soldiers and contingents from other empires [Brosens, 2013; Catherine, 2013]. This near absence is not surprising, as the inclusion of the colonial dimension in the history of Belgium remains very basic [Vanthemsche, 2012]. Little is known about what happened in Congo from June 1914. Consequently, the few material traces scattered throughout the territory of Brussels refer at the very most to the military action of commanders and their men [Claisse, 2013: 133-175]. For example, due to later private initiatives, monuments were erected in the memory of Lieutenant General Tombeur and the Force publique.7 The involvement of the latter’s troops in Africa and of Congolese volunteers in Belgium [cf. Brosens, 2013] (some of them had a direct link with Brussels as they had lived there for some time before the war, in particular in the Anneessens neighbourhood) remains largely unknown today. 54The meaning to be given to these memorial traces must also be questioned, as the underlying patriotic values have little symbolic meaning today. Nevertheless, for several years now, an event organised by associations of former colonials pays tribute “to the victims of slavery campaigns, Belgian and Congolese deaths in campaigns led by the Force publique during the two world wars as well as to the flag of Tabora”8 in three places: in front of the monument for Lieutenant General Baron Tombeur “of Tabora” (1867-1947), in Saint-Gilles (inaugurated in 1951, Avenue du Parc), in front of the bust of Colonel Chaltin (1857-1933) in Ixelles (erected in 1947, Square du Solbosch) as well as in front of the monument “Troupes des campagnes d’Afrique” in Schaerbeek (erected in 1970, Square Riga). 56Two distinct memories thus share the public space in Brussels and try to exist in parallel, away from the main public events. The presence of this dual colonial memory – Belgian and Congolese – in the territory of the capital is all the more interesting since it does not convey the same message in the recognition of the contribution of Congo during the first world conflict, thus resulting in separate commemorations. 57At first glance, the number of buildings in Brussels with a direct connection with World War I is limited. Among these, there is the emblematic example of “Bâtiment A” at Université Libre de Bruxelles on the Solbosch campus along the current Franklin Roosevelt Avenue. Its connection with the first world conflict is twofold: on the one hand, its construction (1924) was financed by American funds via the Commission for Relief in Belgium Educational Foundation, and on the other hand, the financiers imposed façades built in the “national style”10. Other buildings such as Saint-Pierre hospital also received funds from reconstruction programmes. 58In a series of existing buildings, material references to World War I were also inserted. This was the case, for example, with two windows placed in 1920 in the church at Sablon in memory of the people killed during the conflict, representing the Belgian fighters as well as the monarchs [Le Patrimoine monumental de la Belgique. Bruxelles /1C, 1994: 281-282]. Similar windows (with a total of eight in the Brussels region) [van Ypersele, Debruyne & Kesteloot, 2014: 296] were placed in several churches and civil buildings in reference to patriotism, the fight against the occupier and the protection of victims, based on scenes from the Bible or the lives of saints. 59The armed forces changed the name of certain barracks in Brussels in honour of figures and events related to the war [Mihail, 2010: 30-31]. 60The material memory of World War I is not limited to constructions, changes to buildings or new names for specific buildings in Brussels. It also lies in the development and renewal of the urban fabric, due to material destruction caused by the war and the arrival of many refugees, which increased the demographic pressure. Thus, in 2014, of the 194 250 buildings located in the territory of the Brussels region, 53 146 (i.e. 27,36 %) were built during the interwar period [SPF Economie - Statistics Belgium11]. Beyond these figures, it must be noted that at the end of World War I, the debates from before 1914 on the quality of dwellings resurfaced with renewed vigour [Van den Eeckhout, 2010). The interest in this theme is not surprising: in Brussels as in other major cities, the dwellings in working-class neighbourhoods were often overcrowded [Van den Eeckhout, 2011: 95-96]. 61Therefore, the experimentation with new types of housing imagined before the war was pursued and expanded. The model of the garden city, which was becoming more widespread at the end of the 19th century, is one of the most typical examples [Vandermotten, 2014: 158]. It still marks the current landscape of Brussels, with 26 garden cities (these are often residential areas rather than separate neighbourhoods) in 10 municipalities. They are in keeping with a functionalist vision of urban planning which divided the city into separate areas, each with their own role. By building the houses in these cities based on the same plan, costs were greatly reduced and at the same time minimum requirements were able to be met: a shower, a small storeroom or a vegetable garden allowing the inhabitants to occupy themselves usefully and make savings [Dessouroux, 2008: 89-91]. 62However, the lack of means and the constant demographic pressure led architects and local authorities to come up with new ideas, such as high-rise blocks of flats which, for the first time, were imagined by Victor Bourgeois in his visions of the future for Brussels (1920-1930). The economic destruction and upheaval caused by the war prompted the middle-class inhabitants of Brussels to choose to live in flats. The law on co-ownership adopted in 1924 and the rising cost of maintaining large dwellings, associated with the domestic crisis, the gradual decrease in the number of large families and the rise in technical innovations such as lifts, made this collective way of life more conceivable for the upper class in Brussels, in particular as of the 1930s when several luxury buildings were being built [Dessouroux, 2008: 92]. The low-rise model remained popular, however, mainly in the suburbs undergoing urbanisation, where the cost of land still allowed it. 63Far from the traditional monuments, these new types of building seen in the urban space of Brussels also represented direct or indirect traces of World War I, allowing another historical interpretation of the contemporary city. 64At a time when more and more innovative places for learning (in particular outside the school itself) are being sought to give more prominence to new ways of acquiring knowledge, skills and social skills, the city itself may be an interesting setting. From this point of view, Brussels offers a wide range of under-exploited possibilities, due to a lack of innovative educational material. 66The originality of this approach consists in particular in capturing the attention of students by speaking about buildings whose function is usually associated with other themes. For example, the Palais Royal leads to a discussion about the organisation of hospitals (approximately 1 100 beds were set up there at the beginning of the war); Saint Michel and Gudule cathedral and the town hall serve as a basis for a presentation of the passive resistance of figures such as Cardinal Mercier and Mayor Adolphe Max; the column of Congress and the statue of Gabrielle Petit are references to the civilian victims and patriotism, etc. The different members of the civil resistance who had a connection with Brussels – Gabrielle Petit, Edith Cavell and Philippe Baucq – are thus integrated in a national pantheon of figures whose lives are presented to the students. In this regard, one may consult the research on the evolution of the contents of history textbooks over the past one hundred years and on how these “heroes” are presented [cf. Béchet, 2009; Hens, 2015]. 68When we mention the impact of World War I on the social transitions, there is often a reference to changes in the electoral system and related political behaviour, or to the status of women [Cf. Gubin & de Smaele, 2015; Jacques & Piette, 2005: 171-182], and more rarely to other domains which integrate an urban perspective. Yet the examples are not lacking: as it were, World War I served as a laboratory for technical, medical and organisational innovations which are still deeply ingrained in the reality of Brussels today. We shall present some examples below. 69The victims of the war were not exclusively on the front, as many of them were affected by what is referred to as the “invisible enemy”: “… civil and military authorities were faced with the daunting challenge of waging war on disease at the same time as they waged war on the enemy”. The challenge was such that it was referred to as the “other war” [Rollet, 1999: 421]. This did not only involve fighting against disease. Healthcare for mothers and children had become a priority everywhere. This was also the case in Belgium and in particular in Brussels, where a very dense network of associations were established to improve the health of young children. The results were impressive, as in 1918, the mortality risk for a one-year-old child was even lower than before the beginning of the conflict. The Œuvre nationale de l’enfance (ONE), created in 1919, also benefited from the experience acquired during the conflict. Its current work is a direct prolongation of the first infant wellness visits initiated between 1914 and 1918. [Majerus, 2005: 70; Jaumain, Majerus, Amara, Vrints (eds], 2005: 157-182]. 70Once again in the area of health, World War I also revealed the figure of a doctor who left many traces which are still very present in Brussels even though he became known mainly on the front: Antoine Depage. The name of this professor from the faculty of medicine at ULB and who ran Hôpital de l’Océan in La Panne between 1914 and 1918, is associated today with a clinic in Saint-Gilles as well as with one of the five wings at Brugmann University Hospital in Laeken. A bronze monument at the corner of Place Georges Brugmann and Rue Stallaert in Ixelles also pays tribute to him, as well as the name of an avenue along Solbosch Campus at Université libre de Bruxelles [Jaumain (ed. ), 2013: 256]. 72It is a little known fact that the experience of World War I also left many traces in the organisation of the police in Brussels (which still exist today). 73In 1915, the American Raymond B. Fosdick published the results of a study conducted in Europe two years earlier, at the request of the Bureau of Social Hygiene which was created at the instigation of John D. Rockefeller Jr, on the different European police systems. To say the least, the Belgian capital did not make a deep impression on him: “The police force in Brussels is relatively small and insignificant, because the opportunity to form a single unit for the urban area has never been taken” [Fosdick, 1915], he wrote. While he understood the fragmentation of the urban area into 16 municipalities (at the time) and into the same number of police forces, he did not mention the additional complexity, i.e. the fact that the latter shared their administrative and judicial police missions with the national gendarmerie present in most of the municipalities, and incidentally with a handful of gardes champêtres (rural guards). This system underwent a sudden review after the German invasion of 4 August 1914. 74The German occupation called into question the efficiency of the police in two key areas: the judicial police and the maintenance of order. As regards the judicial police, the magistracy had always criticised the police for their lack of knowledge of investigative techniques, such as fingerprinting, for example. Crowned with the prestige of having defied the Germans by decreeing a legal strike in 1918, the magistracy took advantage of it to put forth its demands for after the liberation. Thanks to the action of the (Brussels) minister Emile Vandervelde, a law was voted in 1919 for the creation of a new specialised police unit, i.e. criminal police attached to the public prosecutor’s office. In the area of the maintenance of order, the German authority first pushed the Brussels police to equip themselves better. In spring 1917, they created a sort of mobile brigade within the central management, i.e. the “central permanence”, made up of about forty officers who, for the first time, had a van for their interventions. However, the police were only able to prove themselves during the last weeks of the war, when the social context led to overflows: massive influx of refugees from northern France, period of turmoil for the Soldatenrat, pillaging of the German warehouses by the soldiers themselves, etc. It was only after the proclamation of the state of siege on 17 November 1918 and the intervention of the Belgian military cavalry that the calm returned gradually, as the municipal police themselves did not have enough men and means to maintain order in the capital. In the following months, the gendarmerie was reorganised to become the main force for maintaining order in the country. The creation of mobile brigades responsible for this mission, begun before the conflict, continued with the creation of a mobile legion in Brussels. A monument located in Boulevard General Jacques (made by Eugène De Bremaecker, 1921) is a reminder of the dual nature of the gendarmerie, which continued until the police reform in 2001; police with military status who highlight their war experience to demand more means, as well as a reinforcement of their tasks [see Campion, 2013]. 75Today Brussels is often described as a fragmented city [De Bruycker, 1999], in particular due to the existence of 19 municipalities in the territory of the Brussels-Capital Region, which are sometimes presented in political rhetoric as being baronies. 76Although consultation practices existed already between the municipalities of Brussels before 1914 (see below) and continued afterwards, World War I (as well as World War II) led the occupant to impose joint management which the French-speaking town councillors did not want. The question of the amalgamation of the municipalities – which was attempted partially during both wars under the name of “Greater Brussels” – became a issue in major political and linguistic tensions [Kesteloot, 2003]. 77As soon as they arrived in Brussels on 20 August 1914, the German army staff began negotiations with the mayor of Brussels-City. The occupant made it clear that they would only deal with the mayor of Brussels-City, who would have to relay the injunctions and communications to his counterparts in the other municipalities of Brussels. To do this, the mayor of Brussels turned to the authority which had existed since 1874: the Conférence des Bourgmestres, an informal structure which allowed the mayors of Brussels to discuss issues of common interest, going beyond the territory of their municipality. Until then, the decisions of this Conférence were at most considered as opinions or recommendations, which each mayor brought to his municipal council to be passed. The Conférence was chaired by the mayor of Brussels-City – which was the case until 1973 [Vaesen, 2008] – and initially, gathered the municipalities bordering Brussels-City. In 1912, this criterion was replaced by that of the “continuity of inhabitants”, or in other words of “continuous urbanisation”. the circumstances granted Mr Max with a sort of dictatorial power and, due to the pressure of the circumstances, a sort of accidental administrative merger occurred between all of the municipalities of the urban area of Brussels, which at any other time would have led to countless objections and much opposition [Gille, Ooms, Delandsheere, 1919: 24]. 79Despite this desire for centralisation, the Germans also dealt directly with the municipalities for certain issues, such as when they needed information which was kept separately. One may wonder whether the German authorities pursued a dual policy: centralised in most cases but local when they hoped for better results. The discussions between the local authorities and the adoption of an identical position may have allowed the municipalities to take a more uncompromising stance, sometimes leading the occupant to implement a strategy of division with respect to the mayors of Brussels. 80Unlike financial matters in which the town councillors of the urban area did not always share the same opinion, the linguistic issue provided them with the occasion to take a firm and united stance with respect to the demands of the occupant and the projects of Flemish activists. From January 1915, a “Flemish affairs committee” was created by the occupant. The number of its interventions in the capital increased in order to enforce the legislation regarding the use of languages in the administration and especially in schools. After several months, the pressure grew and all of the municipalities of Greater Brussels – apart from Ixelles – were declared “Flemish municipalities” under the decree of 15 November 1916 on provisions related to the organisation of Belgium in three administrative areas (German, Flemish and Walloon). Finally, on 21 March 1917, the proclamation of the administrative separation united Brussels with Flanders. The Brussels mayors protested together against these decisions, an approach which they reiterated during the promulgation of the independence of Flanders by the “Raad van Vlaanderen”. Evidently, the linguistic issue pushed the patriotic reaction of Brussels town councillors furthest. 81While the war continued on the Yser front, the Conférence des Bourgmestres therefore attempted to maintain the image of Brussels society united against the occupant thanks to a true feeling of solidarity, which went beyond any political differences. 82The practices implemented between 1914 and 1918 left traces in people’s minds. Thus, after the liberation, Adolphe Max tried to harness the dynamics in order to bring an old dream back onto the agenda: the reunion of Brussels and its suburbs. The debate remained open and was temporarily brought to a close by the annexation of the municipalities of Laeken, Neder-over-Heembeek and Haren to the City of Brussels in 1921. 83Although it was no longer a question of creating a “Greater Brussels”, the notion of the urban area of Brussels, its boundaries and its competence continued to be the subject of much thought. The debate emerged on several occasions during the interwar period [De Groof, 2003] and then in the context of the second occupation when, from May 1940 to September 1942, the Conférence des Bourgmestres had to play a major role once again when the Germans chose to deal only with the mayor of Brussels. Once again, the local authorities were quite alone against the occupying country which, in September 1942, went much further than during the first world conflict in the establishment of a “Greater Brussels”. The traditional mayors were dismissed to the benefit of a mayor of the new order with connections to the VNV and, more than in 1914, the occupation was marked by the desire to make the capital Flemish. 84After World War II, the theme emerged less often in the political discussions, apart from a few periods in particular: during the immediate post-war period in reference to the collaboration with the German occupation forces, and then in the 1960s, when the territorial expansion of Brussels was once again on the political agenda. Some people felt that it was the ideal political and administrative scale for the management of Brussels. However, in 1976, only Brussels “escaped” the major municipal amalgamation movement [De Ceuninck, 2009] and preserved its 19 municipalities. It is clear that the establishment of “Greater Brussels” – German and Flemish – during the two world wars acted as a foil to any attempt at amalgamation. 85New references to “Greater Brussels” appeared once again in the 1990s, in the framework of discussions on the territorial expansion of Brussels, whose main subject was the municipalities with facilities. More recently, the term was used in relation to the cooperation between the 19 municipalities of Brussels and the surrounding municipalities before the expression “metropolitan community of Brussels” was mentioned in the package of measures voted during the sixth state reform to create a tool for cooperation in a certain number of areas such as mobility [Van Wynsberghe, 2013]. However, they refer to different realities: in certain cases the expression is used in reference to a territorial definition of Brussels and its suburbs, in other cases, it refers to discussions related to territorial expansion or an internal administrative overhaul. The figure shows that the subject continued to be discussed regularly during the interwar period and to a lesser extent after World War II. 86This synopsis constitutes a first attempt at an inventory of the material and immaterial heritage of World War I in Brussels. 87More than one hundred years after the outbreak of the conflict, this exceptional historical event left many traces in the streets, buildings and the collective imagination of the inhabitants of the only western European capital occupied between 1914 and 1918. 88It is above all the number of stakeholders involved in the remembrance of the war in Brussels which may seem surprising: federal state, region, communities, municipalities, semi-public organisations, private associations, universities and people who are simply curious, with each one focusing on this period according to their own interests, producing a large amount of information in many different forms (publications, exhibitions, conferences, ceremonies, etc.). 89While this proliferation illustrates a true curiosity about World War I, the historical knowledge of the reality in Brussels during this period remains very fragmented. Faced with a fragmented thematic and geographic approach, a global summary of the war experience in the entire urban area of Brussels is lacking. 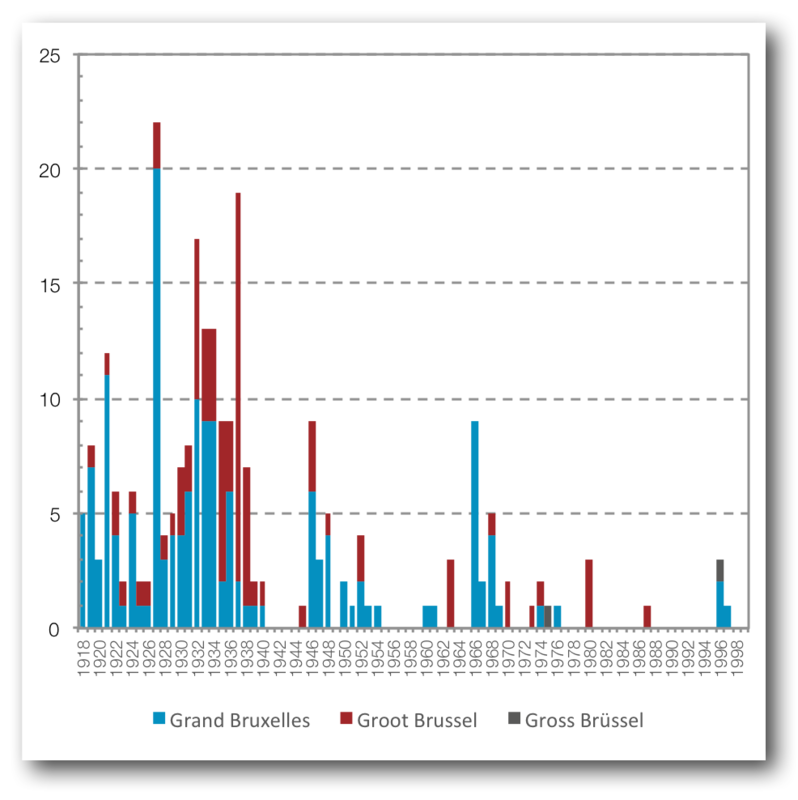 The elements of analysis outlined in this synopsis on the demography of Brussels, the lack of certainty regarding the number of victims of the conflict from Brussels, the relations between the Pentagon and the outskirts, and the interactions between already urbanised spaces and the surrounding countryside – to mention only a few examples – illustrate the existence of vast areas of investigation which have scarcely been dealt with in research. 90The material and immaterial traces of World War I in Brussels also raise questions as to the role of the historian in the knowledge of the past, the transmission and the (re)writing of it by future generations when the direct witnesses of the event have passed away. In reality, the contemporary views – varied, partial and specific – of the remains of the Great War in Brussels tell us more about current urban societal challenges than about what happened during those four years in the Belgian capital. The relative omission of many refugees and deportees from Brussels as well as the many conflicting memories of the action of colonial troops during the war deserve to be questioned. 91Which elements motivate the references to and use of the history of World War I today? What do we remember? And above all, why? One century after these events, it is interesting to note that, while academic research has focused on a “bottom-up” approach to the conflict for several decades, the classic pantheon of national heroes, written on our street signs or engraved in stone (King Albert, Adolphe Max, Gabrielle Petit, Cardinal Mercier, etc.) still constitutes the preferred means to teach the general public about this past, and in particular students. 92For the first time since its creation in 1989, the Brussels-Capital Region is taking part in a major commemorative event which is not only linked to its role as national capital. Gradually, like the other Regions, a heritage and memorial policy has been implemented. In this respect, the hundredth anniversary of the Great War constitutes a key moment. For Brussels, this involves highlighting a specific approach – the experience of an occupied capital – without monopolising the commemorations, as other entities and levels of authority also intend to be present. 93One may question the dynamism of this commemoration in the long term. The year 1914 was unquestionably a memorial “peak” in Brussels and elsewhere. More than likely, the same will be true in 2018. Brussels has already been chosen by the federal government as the place where the end of the war will be celebrated officially. 94It is still too early to make an assessment, but the manner in which the Region of Brussels approaches these events will deserve a special study. The part of the commemorated past which is specifically related to Brussels must be examined. In other words, has there been a commemoration of “the experience of war” in Brussels — that of an occupied city, which did not experience any battles, while its men were off fighting? Or, on the contrary, has the Great War been commemorated in general, and even the Great War in the Belgian territory, without focusing on Brussels? The answers to these questions will certainly be nuanced. 95Finally, it is already clear that it is not so much the past as a subject of knowledge which is on the programme for the hundredth anniversary, but rather the highlighting of values which have meaning in today’s society: the defence of freedom, solidarity, democracy, etc. This involves a remembrance of the “experience of war” lived by civilians and soldiers of all origins who were on Belgian soil. In other words, the idea of a past as a tool for cohesion and a lever for integration is essential, a past which addresses everyone: the inhabitants of Brussels from here and elsewhere, history enthusiasts, lovers of memorial tourism, the non-natives, expatriates, day trippers, etc. AMARA, M., 2010. Des exilés à l’heure du retour. Les réfugiés en Belgique à la fin de la Première Guerre mondiale (1918-1919). In: TALLIER, P.-A. & NEFORS, P. (ed. ), Quand les canons se taisent. Bruxelles: Archives Générales du Royaume, pp. 211-223. BARTAL, D., CHERNYAK-CHAI, L., SCHORI, N., & GUNDAR, A., 2009. A sense of selfperceived collective victimhood in intractable conflicts. In: International Review of the Red Cross, 91, 229–258. BECHET, C., 2009. La révision pacifiste des manuels scolaires. Les enjeux de la mémoire de la guerre 14-18 dans l’enseignement belge de l’Entre-deux-guerres. In: Cahier d’Histoire du Temps présent, 2009. No 20, pp. 49-101. BENVINDO, B., MAJERUS, B. & VRINTS, A., 2014. La Grande Guerre des historiens belges, 1914-2014. In: Revue belge d’histoire contemporaine. 2014. Vol. 2-3, pp. 170-196. BOST, M. & KESTELOOT, C., 2014. Les commémorations du centenaire de la Première Guerre mondiale. Bruxelles: Courrier hebdomadaire du CRISP, No 2235-2236. CLAISSE, S., 2000. Le déporté de la Grande Guerre : un « héros » controversé. Le cas de quelques communes du Sud Luxembourg belge. In: Cahiers d’Histoire du Temps présent. 2000. No 7, pp. 142-143. CLAISSE, S., 2013. Du soldat inconnu aux monuments commémoratifs belges de la guerre 14-18. Bruxelles: Académie Royale de Belgique. DE BRUYCKER, P., 1999. Le défi de l’unité bruxelloise. In: WITTE, E., ALEN, A., DUMONT, H. & ERGEC, R. (eds. ), Het statuut van Brussel / Bruxelles et son statut. Bruxelles: De Boeck-Larcier, pp. 465-472. DE CEUNINCK, K., 2009. Politieke besluitvorming in België over de fusies van 1976. Thèse de doctorat en sciences politiques. Gand. Universiteit Gent. DE GROOF, R., 2003. De kwestie Groot-Brussel en de politieke metropolisering van de hoofdstad (1830-1940). Een analyse van de besluitvorming en de politiek-institutionele aspecten van de voorstellen tot hereniging, annexatie, fusie, federatie en districtvorming van Brussel en zijn voorsteden. In: WITTE E. (ed. ), De Brusselse negentien gemeenten en het Brussels model. Bruxelles/Gand: De Boeck - Larcier, pp. 3-55. DELPLANCQ, T., 2001. Une chasse aux « oisifs ». Les déportations de civils à Bruxelles en 1917. In : DAELEMANS, F. & VANRIE, A., (ed. ), Bruxelles et la vie urbaine. Archives – art – histoire. Recueil d’articles dédiés à la mémoire d’Arlette Smolar-Meynart (1938-2000). Bruxelles: Archives et Bibliothèques de Belgique, pp. 524-534. DE SCHAEPDRIJVER, S., 2005. An outsider “inside”: the occupation diary of Georges Eekhoud. In: JAUMAIN, S. (ed. ), Une guerre totale ? La Belgique dans la Première Guerre mondiale, nouvelles tendances de la recherche historique. Bruxelles: Archives Générales du Royaume, pp. 79-96. DE SCHAEPDRIJVER, S., 2010. Vile times. Belgian interwar literature and the German occupation of 1914-1918. In: TALLIER, P.-A. & NEFORS, P. (ed. ), When the guns fall sillent. Proceedings of the international colloquium (Brussels, 3-6 November 2008). Bruxelles: Archives Générales du Royaume, pp. 535-554. DESSOUROUX, C., 2008. Espaces partagés, espaces disputés : Bruxelles, une capitale et ses habitants. Bruxelles: Région de Bruxelles-Capitale. DE VOS, L., SIMOENS, T., WARGNIER, D. & BOSTYN, F., 2014. 14-18: oorlog in België. Louvain: Davidsfonds. EGGERICKX, T., 2014. L’impact démographique de la Première Guerre mondiale. Tendances générales et diversités spatiales. In: HASQUIN H. (ed. ), La bataille de Charleroi. 100 ans après. Bruxelles: Académie Royale de Belgique, pp. 105-135. Fabrique d’art. La Compagnie des Bronzes de Bruxelles (1854–1979). Les Cahiers de la Fonderie, 2004. No 28-29. Bruxelles: La Fonderie. FERGUSON, N., 1998. The Pity of War: Explaining World War I. Londres: The Penguin Press. FESTY, P., 1984. Effets et répercussions de la Première Guerre mondiale sur la fécondité française. In: Population. 1984. No 6, pp. 977-1010. FREJKA, T. & SOBOTKA, T., 2008. Fertility in Europe: diverse, delayed and below replacement. In: Demographic Research. 2008. Vol. 19, pp. 15-46. FRICK, H. & LYNEN, A., 1920. Histoire de la commune de Saint-Josse-ten-Noode pendant la guerre mondiale et l’occupation allemande 1914-1918. Bruxelles: A.Lesigne. GILLES, L., OOMS, A. & DELANDSHEERE, P., 1919. Cinquante mois d’occupation allemande. Bruxelles: Albert Dewit (4 vols). GUBIN, E. & DE SMAELE, H., 2015. Femmes et hommes en guerre, 1914-1918. Waterloo: Renaissance du Livre. JACQUES, C. & PIETTE, V., 2005. Une grande bataille : sauver l’enfance. In : JAUMAIN, S., AMARA, M., MAJERUS, B. & VRINTS, A. (ed. ), Une guerre totale? La Belgique dans la Première Guerre mondiale : Nouvelles tendances de la recherche historique… Bruxelles: Archives Générales du Royaume, pp. 157-182. JACOBS, M., 1995. “Zij, die vielen als helden…” Cultuurhistorische analyse van de oorlogsgedenktekens van de twee wereldoorlogen in West-Vlaanderen. Bruges: Provincie West-Vlaanderen. JANSSENS, G., 2013. De Grooten Oorlog in Brusselse straatliedjes uit 1914-1918. Louvain: Acco. JAUMAIN, S. & PIETTE, V. (ed. ), 2005. L’humour s’en va-t-en guerre : Bruxelles et la caricature en 14-18. Bruxelles: Archives de la Ville de Bruxelles. JAUMAIN, S., Piette, V. & PLUVINAGE, G., 2005. 14-18 : au jour le jour, une ville en guerre. Bruxelles: Musées de la Ville de Bruxelles. JAUMAIN, S., AMARA, M., MAJERUS, B. & VRINTS, A. (ed. ), 2005. Une guerre totale ? La Belgique dans la Première Guerre mondiale : Nouvelles tendances de la recherche historique… Bruxelles: Archives Générales du Royaume. JAUMAIN, S. (ed. ), 2013. Dictionnaire d’histoire de Bruxelles. Bruxelles: Prosopon éditions. KAVADIAS, D., 2004. Voltooid verleden tijd? Het verband tussen kennis over de nazi-genocide en democratische attitudes bij adolescenten in Brussel. In: Res Publica, 2004. No 4, pp. 535-554. KESTELOOT, C. 2003. Le Grand-Bruxelles et les après-guerres. In: WITTE, E., ALEN, A., DUMONT, H., VANDERNOOT, P. & DE GROOT, R. (ed. ), De Brusselse negentien gemeenten en het Brussels model / Les dix-neuf communes bruxelloises et le modèle bruxellois. Bruxelles: Larcier, 2003, pp. 83-106. LEFEVRE, P. & LORETTE, J. (ed. ), 1987. La Belgique et la Première Guerre mondiale. Bibliographie. Bruxelles: Musée Royal de l’Armée. LIU, J. H., GOLDSTEIN-HAWES, R., HILTON, D., HUANG, L. L., GASTARDO-CONACO, C., DRESLER-HAWKE, E., 2005. Social representations of events and people in world history across 12 cultures. In: Journal of Cross-Cultural Psychology. 2005. Vol.36, No 2, pp. 171-191. MAJERUS, B., 2005. La mort à Bruxelles, 1914-1918. In: Cahiers d’Histoire du Temps Présent. 2005. Vol. 15, pp. 65-81. MAJERUS, B. & SOUPART, Sven (ed. ), 2006. Journal de guerre de Paul Max : notes d’un Bruxellois pendant l’occupation (1914-1918). Bruxelles: Archives de la Ville de Bruxelles. MAJERUS, B., 2007. Occupations et logiques policières : la police bruxelloise en 1914-1918 et 1940-1945. Bruxelles: Académie royale de Belgique. MASUY-STROOBANT, G., 2007. Les enfants et la guerre. In: JAUMAIN, S., AMARA, M., MAJERUS, B., VRINTS, A. (ed. ), Un guerre totale ? La Belgique dans la Première Guerre mondiale. Bruxelles: Archives générales du Royaume, pp. 157-170. NATH, G. & VAN ALSTEIN, M., 2012.14-18 van dichtbij. Inspiratiegids voor lokale projecten over de Grote Oorlog. Louvain & Den Haag: Acco. MIHAIL, B., 2010. Le patrimoine militaire. Bruxelles: Région de Bruxelles-Capitale - coll. Bruxelles, Ville d’Art et d’Histoire, No 50. MIHAIL, B., 2014. Monuments aux morts et aux héros de la patrie. L’héritage commémoratif des deux guerres mondiales à Bruxelles, In: Bruxelles Patrimoine. 2014. No 11-12, pp. 76-101. PROST, A. & Winter, J., 2004. Penser la Grande Guerre. Un essai d’historiographie. Paris: Seuil. ROHRBASSER, J.-M. (ed. ), 2014. Bouleversements démographiques de la Grande Guerre. Paris: Ined. ROLLET, C., 1999. The “other war” I: protecting public health - The “other war”II: setbacks in public health. In: Winter, J., Robert, J.-L., 2004. Capital Cities at War. Paris, London, Berlin – 1914-1919. Cambridge: Cambridge University Press, pp. 421-486. SCHELLEKENS, J., VAN POPPEL, F., 2012. Marital fertility decline in the Netherlands; child mortality, real wages, and unemployment, 1860-1939. In: Demography. 2012. Vol. 49 (3), pp. 965-988. SCHOLLIERS, P., DAELEMANS, F., 1988. Standards of living and standards of health in wartime Belgium. In: WALL, R. & WINTER, J. (ed. ), The upheaval of war. Family, work and welfare in Europe, 1914-1918. Cambridge: Cambridge University Press, pp. 139-158. SCHOLLIERS, P., 1978. Koopkracht en indexkoppeling. De Brusselse levensstandaard tijdens en na de eerste wereldoorlog, 1914-1925, In: Revue belge d’histoire contemporaine. 1978. Vol. 3-4, pp. 333-380. SIEBEN, L. 1988. De novemberdagen van 1918 te Brussel: revolutie en ordehandhaving. In: Lefèvre, P. & De Gryse, P. (ed. ), De Brialmont à l’Union de l’Europe occidentale : mélanges d’histoire militaire offerts à Albert Duchesne, Jean Lorette et Jean-Léon Charles. Bruxelles: Musée royal de l’Armée, pp. 155-176. SMOLAR-MEYNAERT, A. (ed. ), 1989. La région de Bruxelles. Des villages d’autrefois à la ville d’aujourd’hui. Bruxelles: Crédit communal. STENGERS, J. (ed. ), 1979. Bruxelles : croissance d’une capitale. Anvers: Mercator. TALLIER, P.-A. & SOUPART, S., 2001, La Belgique et la Première Guerre mondiale : ouvrages édités de 1985 à 2000. Bruxelles : Musée Royal de l’Armée. TWELLS, J. H., 1919. In the prison city. Brussels, 1914-1918. A personal narrative, Londres: A. Melrose. TYTGAT, C., 1919. Journal d’un journaliste. Bruxelles sous la botte allemande. Bruxelles: Imprimerie scientifique C.Bulens. VAESEN, J., 2008. Osmose, dwang en tegenmacht? 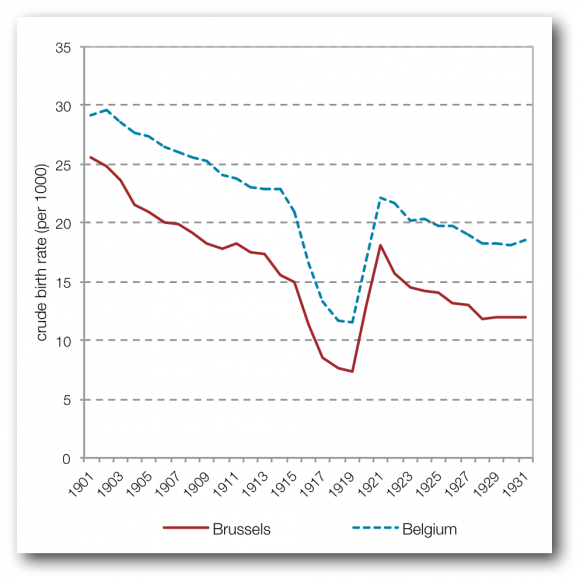 De verhoudingen tussen de openbare besturen in Brussel, 1970-2004. Thèse de doctorat en histoire. Bruxelles. Vrije Universiteit Brussel. VAN CAUBERGH, P., 1986. Les débuts de la Première Guerre mondiale à Bruxelles (juillet-décembre 1914). Mémoire de fin d’études en histoire. Louvain-la-Neuve: Université Catholique de Louvain. VAN DEN EECKHOUT, P.,2010. “De onbewoonbare krotten zijn etterende middens, waar al de ziekten van het sociaal korps gisten”. De kruistocht tegen de krotwoningen in het interbellum. In: KOK J. & VAN BAVEL, J.(eds. ), De levenskracht der bevolking. Sociale en demografische kwesties in de Lage Landen tijdens het interbellum. Louvain: Universitaire Pers Leuven, pp. 321-353. VAN DEN EECKHOUT, P.,2011. Krotten als metafoor voor een verrotte maatschappij. Les taudis (1929) van Léon Degrelle. In: Cahiers d’histoire du temps présent/ Bijdragen tot de Eigentijdse Geschiedenis, 2011. Vol.23, pp. 95-121. VAN YPERSELE, L., DEBRUYNE, E. & KESTELOOT, C., 2014. Bruxelles, la mémoire et la guerre (1914-2014). Bruxelles-Waterloo: Renaissance du Livre. WINTER, J.M., 1988. Some paradoxes of the First World War. In: WALL, R. & WINTER, J. (ed. ), The upheaval of war. Family, work and welfare in Europe, 1914-1918. Cambridge: Cambridge University Press, pp. 9-42. WINTER, J.M., 1992. War, family, and fertility in Twentieth-Century Europe. In: GILLIS, J.R., TILLY, L. A, LEVINE, D. (ed. ), The European experience of declining fertility, 1850-1970. The quiet revolution. Cambridge: Blackwell. pp. 291-309. WINTER, J. & ROBERT, J.-L., 1999. Capital Cities at War. Paris, London, Berlin – 1914-1919. Cambridge: Cambridge University Press. WINTER, J., 2013. La Première Guerre mondiale (vol. 1: Combats). Paris: Fayard. 2 This analysis is based exclusively on the names which appear in the titles of contributions. It of course does not reflect the entire geographic space covered by each of these publications. Nevertheless, it provides a good statistical indication of the places which were the subject of specific studies. 3 It is difficult to provide exact figures as there are discrepancies in the figures presented by the sources. This number comes from the statistics of the Commission d’enquête sur la violation des règles du droit des gens. AGR, Commission d’enquête sur la violation des règles du droit des gens, des lois et des coutumes de guerre, no 740 and 742. 4 It is interesting to point out that this omission exists in the historiography. The doctoral thesis by Michaël Amara (Des Belges à l'épreuve de l'exil: les réfugiés de la Première guerre mondiale (France, Grande-Bretagne, Pays-Bas), 1914-1918, ULB, 2007. Available at: http://difusion.ulb.ac.be/vufind/Record/ULB-DIPOT:oai:dipot.ulb.ac.be:2013/210703/Holdings) will provide us with a complete study of the Belgian refugees, whereas Arnaud Charon is working on a thesis on the subject of the deportees. 5 Jass was the nickname given to a Belgian soldier during World War I. It is a reference to the long coats (“jas” in Flemish) worn by the troops in uniform. It may be considered as the equivalent of the French Poilu or the English Tommy. 6 The expression as it is used in French (unspoken assumptions) is found implicitly in the works by James Joll, such as The Origins of the First World War, New York, Routledge, 2013 (1st edition 1984) with a chapter devoted to the imperial rivalries (pp. 219-253). See Antoine Prost and Jay Winter (2004) for the different challenges related to writing about the experience of war. 8 Located in modern-day Tanzania, the city of Tabora was the scene of an act of war in which the (Congolese) Force publique, led by Lieutenant General Charles Tombeur during the 1916 campaign in German East Africa. In the official story, this was the first Belgian victory. It led to the ennoblement of Tombeur in 1926 and allowed him to add de Tabora to his name. 12 Presentation of the circuit on the site of Classes du Patrimoine: « 14-18. Bruxelles, ville occupée » http://www.classesdupatrimoine.be/fr#animation_14_18. 13 This theme will be explored in the BSI synopsis on the memorial policies related to the hundredth anniversary of World War I (to be published in 2017).